The TV antenna tripod mount is one of the simplest and easiest mounts to install. Installed properly it's also the strongest. Unfortunately the tripod mount has received a bad rap over the years simply because of poor installation methods. This page will guide you step by step through the process of properly installing a TV antenna tripod mount. Follow these guidelines and your tripod installation will never leak or become unstable. 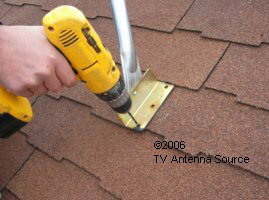 As a matter of fact the tripod installation will outlast the life of most roof shingles its installed on. If you need help before, during, or after the installation please contact me at dithaca@msn.com anytime. Or call 989 875 4902 Monday through Friday from 9:00 AM to 4 PM Eastern Standard Time. A. Unfold the tripod and loosen pipe support bolts. B. Insert mast pipe into the tripod and tighten pipe support bolts. C. Place the tripod on the roof peak. A. Locate the center of the roof rafters (a stud finder is recommended) mark each location with chalk. B. Place each leg platform over a rafter. A. Apply the roof sealing pads to the bottom of one tripod leg platform. B. Place the platform leg with the sealing pad applied directly over the center of the marked roof rafter. C. While maintaining the leg platform over the center of the rafter level the tripod. If necessary place a level against the mast pipe that is already installed into the tripod. D. When the tripod is level firmly press the centered leg platform (with the sealing pad) to the roof directly over a roof rafter. A. With the leg platform firmly pressed onto the roof drill pilot holes in the two outside holes of the leg platform into the roof and rafter using a drill bit about half the diameter of the lag screws. Predrilling will prevent the lag screws from splitting and cracking the wood. B. Insert a lag screw into the predrilled holes and tighten firmly until the sealing pad begins to ooze out from underneath. D. Repeat steps 3 and 4 on the remaining leg. Note: 3 foot tall tripods will not align to roof rafters and are intended for use with TV antennas no larger than 80 inches or antennas such as the MS 2000 rotorfree TV antenna. 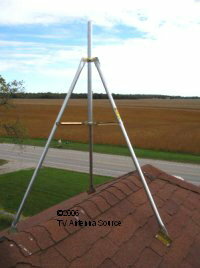 A properly installed TV antenna tripod will provided 20 years or more of trouble free service. A poorly installed tripod will last until the next big windstorm. Do it right, do it once, and be done with it! Have a question about tripod installation?? ?